In this series I will be posting a weekly video on my YouTube channel that you can follow along at home. It’s free to subscribe to the website so you can keep updated with the painting progress. ..
You can watch Part 1 of the painting demonstration here. Jam jar for cleaning brush. Following on from establishing the dark tones last week we can now start to introduce white. 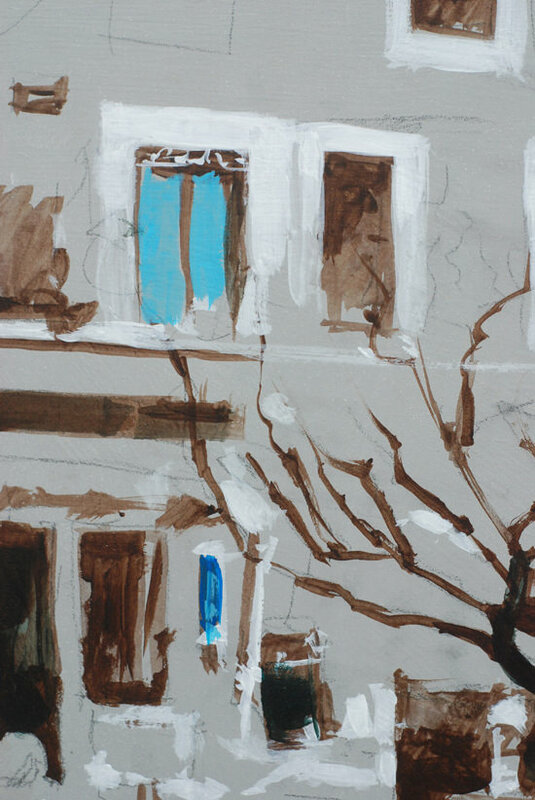 Using the opaque Titanium White I start to draw in the lightest lights of the scene, even though it’s an opaque white I’m applying it quite thinly. This is so I can start to see the ‘drawing’ of the painting, rather than going in too thick with the paint at this early stage. 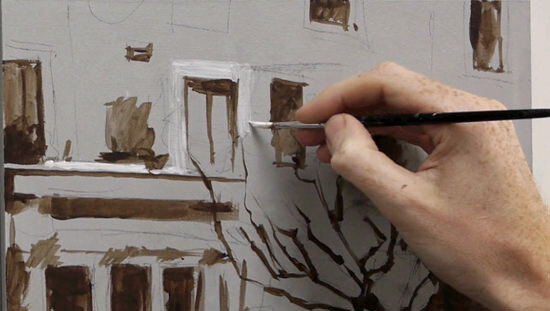 It’s then easier to adjust the drawing without having to paint over thick passages of paint. You can read more about the importance of contrast in your painting. This is the painting after the lights have been painted in. Once we’ve established the darks and the lights we can start to judge how the scene is working tonally. Once you’re happy with your painting at this stage you can introduce a blue. As there are areas in the image that have a greeny blue hue I’m using a Phthalo blue (Green shade). This is a very powerful blue with a high tinting strength. Notice the vivid undertone of the paint in the image below. We can then add areas of the brighter blue around the scene. Notice how the paint is still quite translucent. 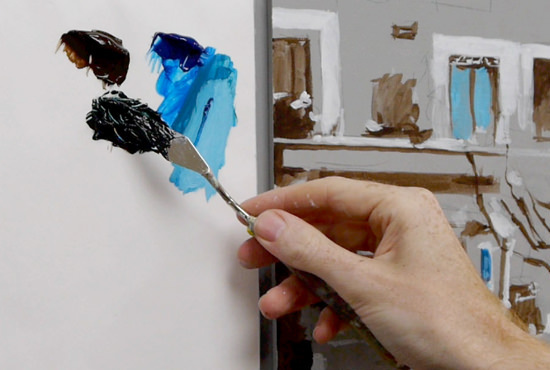 Once the lighter blues are painted in I mix a black with the Burnt umber & Phthalo Blue using the palette knife. 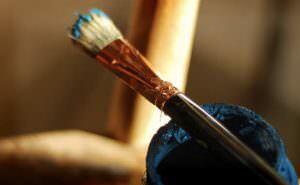 This can then be blushed over the Burnt umber under-painting to enhance and darken the shadow areas of the painting. 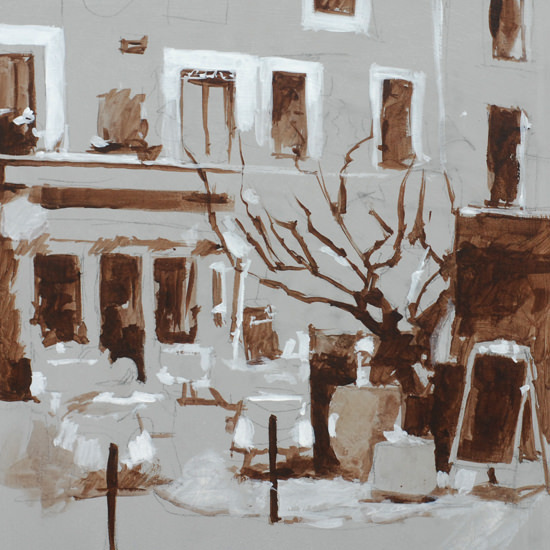 Toning the colour down with the burnt umber to produce a dull green/black to paint in the cafe front. 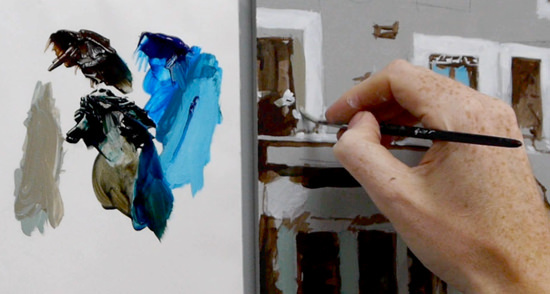 The video below shows the lightest lights and blue stages of the painting. Here’s what the painting looks like at the end of Part 3. Click here if you want to download it to work from. Tune in next week when we start to introduce reds into the painting. Merci! Very interesting the way you do your vidéo. Will help me a lot. Hope I will receive part 4 and others. Thank you for communicating the way you paint. You’re welcome Lorraine, great to hear you’re finding the tutorial helpful. Hey Frank, nice to here from you, pleased the painting coming along well. Hi Curiosity killed the Cat, but when you were painting the white around the windows, the one that you painted light Blue you made a scribble mark with the Titanium White. Why? Are you referring to the part at 2 min 16 sec? If you have a look on the reference image on part 1, this is decorative ironwork on the window frame. It’s great! I learned a lot from your video. I am looking forward to the part 4. I am a very very beginner for painting, Thank you for helping me out! You’re welcome Rubing, pleased you’re learning a lot from the videos. Lecture already getting very tempting, I finish the portrait I am on and start this lesson. Really enjoying your videos and so appreciate your generosity.! Cheers Rose, pleased you’re enjoying the tutorials. You have given me the confidence to pick up a paint brush after 20+ years of not touching one, and then, never acrylic…now, because of you, I can actually see that I am learning! Thank you, thank you, thank you! Hi Lynda, that’s brilliant to hear, so pleased you are enjoying learning a new skill, and a new medium! Thanks Heather, kind of you to say so. Thanks Cynthia, pleased you’re enjoying the course. thank you so much for the best way you do . thanks for doing these videos , will help me a lot. You’re welcome Lili, great to hear its helping your paintings. 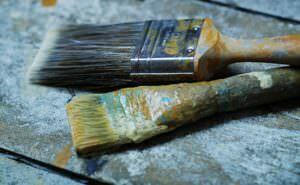 Thoughly enjoying watching you the way you paint and I am learning how you use your brush strokes on the canvas. It’s loose painting that I am interesting as I am a bit too perfectionist in my paintings. Although I am deaf from birth I cannot hear what you said on the video but I am able to follow you very well with all you hand movements. Looking forward to the next video. Thanks Robbie, I’m working on those transcripts, so soon you’ll be able to follow along with full instructions. Thanks Will, much appreciating these vids. Sometimes my confidence goes down the drain but seeing you pull a painting together is helping me to focus my mind. Looking forward to part 4. You’re welcome Vivienne, painting can sometimes be an up and down journey – as some paints seem to flow so easily, and others your question yourself if you’re making any progress at all! Pleased you’re finding the tutorials are helping your focus. When you were adding the white highlights, it made the background canvas look grey. Was your canvas underpainted a grey before you did your sketch? Yes, that’s right Nancy, I’m painting on a coloured toned ground colour, a light grey mixed from raw umber & white. 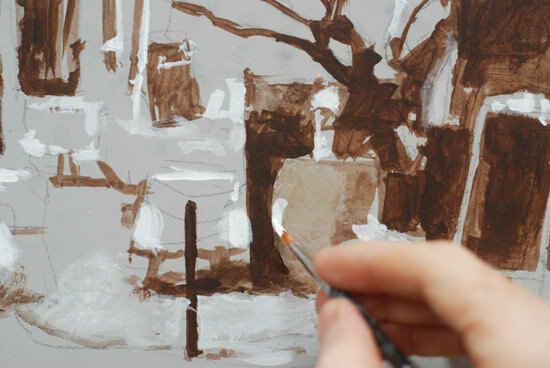 What made you choose a grey for underpainting as opposed to the raw umber you used in your French countryside painting? Hi Nancy, for this scene the grey is a mix of raw umber & white, it is a close match in tone to the cobbles in the foreground so will make a nice tone to work from. It is so kind and generous of you to share and encourage others. I like the way you show how the painting is built up and you do paint very beautifully. 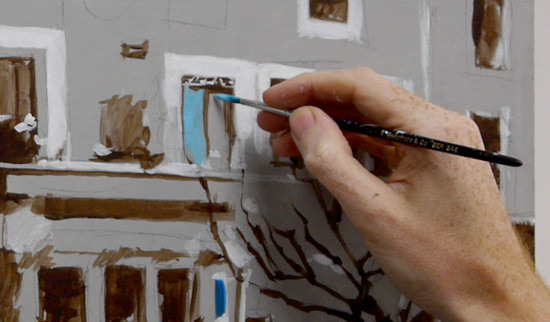 I need to ask something – isnt it necessary to prime canvas with ochre colour prior to painting? May universe rewards you for your nice efforts. Thank you kindly. Hi Maya, for this painting I’m still working on a coloured ground, it is a light grey (mixed from raw umber & white) rather than Yellow ochre. You can vary the ground colour depending on the subject you are painting. Great way to teach. i am still learning from you. please post all video. Thanks Sunil, pleased you’re still learning new painting techniques. This parts are just fantastic! Thank you so much for sharing, you are so inspiring! Thanks very much Catharina for your kind comments, so pleased you’re enjoying the tutorial. I am learning so much watching you paint. It’s amazing how you are getting so much of the painting done just by choosing and mixing a few colors. I am realizing that I have tried to use too many different colors in my paintings in the past. Thanks for sharing your awesome talent with us. Thanks Perri, very kind of you to say so, a ‘less is more’ approach can really transform your paintings. Thank you Will so much. 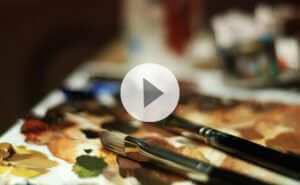 This series of videos is another very valuable and helpful tool you share with us through your art school. Thank you once more!!! You’re welcome Christina, thanks for your kind comment. Enjoying the French Cafe scene. Thanks for the link ,looking forward to the next stage. Thanks Nuala, pleased you’re enjoying it. Hello Will, WOW I am having a wonderful time just watching this painting come to life. I love the greens and browns along with the white to add such depth to this picture. I really am surprised at myself , what I mean is that I like this particular style of work, not that I have arrived. I know this will not be exactly like yours, but just the teaching is so rewarding to me. I never was able to go to art school while I was younger and this really makes my day! Love watching you paint. You are so awsome! Thanks for the videos. Cheers Rubie, kind of you to say so. Love your style and video. Thanks Ginny, pleased you’re enjoying it. I AM AMAZED. You are so generous with your talent. I HAVE taken some lessons and I have taught art but no teacher I have learned from has been as through and explicit. Keep up the good work. I am learning a lot and intend to share it. Thanks. Cheers Audie, kind of you to say so, really pleased you’ve been enjoying the lessons. Hi Will – once again thanks for the progress painting they are very helpful. I took a break to do your drawing course which was wonderful, especially the feedback you provided, so now back to the Café scene before I start the portrait course. Once again many thanks. You’re welcome Gloria, pleased it has helped. I enjoy every moment of your tutorial. Big help! Thanks a lot! Good one Lazar, really pleased you enjoyed the tutorial, looking forward to hearing how your painting turned out. This helps a lot! thank you so much! I don’t how can aspiring painters like me thank you enough! I have been “painting”–I’m not so confident yet that it can be called as such– before but I noticed I’m painting in a different way such as I do not start painting with the dark colors but I start painting whatever the background is and I’ll paint last the foreground. Is that wrong? Hi Christelle, different paintings can have different approaches, but for a classical, realist approach this technique works very well.